But I have been trying to get out and about. Yesterday had lunch with two of my favourite women … Goddess and AngelKitten. We lunched at Nathalie’s Gourmet Studio, and were totally utterly blown away by the dessert. 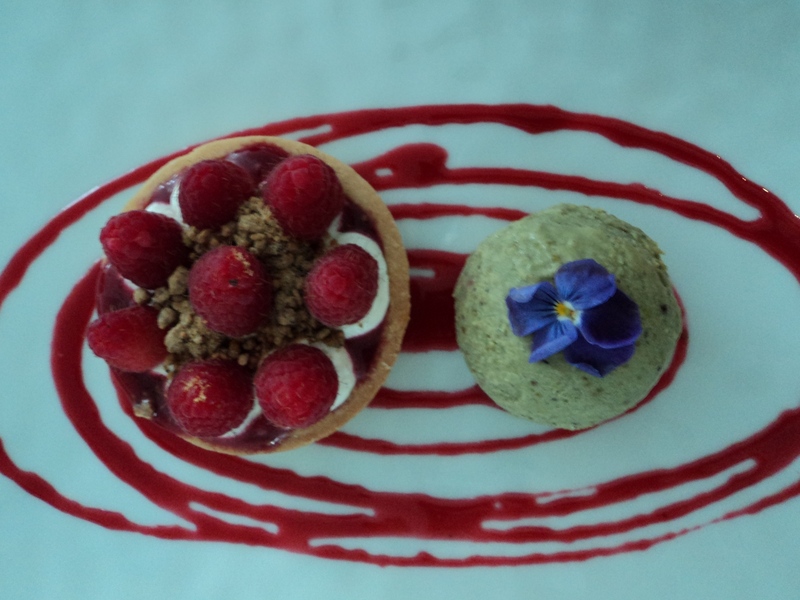 A gorgeous, decadent, stunningly pretty raspberry tart accompanied by pistachio ice cream. The ice cream was a revalation. Nutty and dark goldgreen, it wasnt too sweet, and tasted intensely, purely of pistachios. And who knew that raspberries and pistachios were best taste friends? What an extraordinary taste combination … and so inspirational! It inspired AngelKitten and I so deeply that we immediately went home and made ice cream – a ripple of gorgeously tart passionfruit and glowing raspberries. And it made me imagine a tart, which I will make for Thanksgiving … pistachio crust, dark chocolate pastry cream, and raspberries sitting atop a gentle cloud of whipped cream. Perfection. Which brings me to Thanksgiving. Last year, I was at my sister’s house, and it was wonderful! Cooking with those that you love – its the ultimate form of holiday celebrations. This year, I am far away from my family, but close to the family of my heart. So we are doing a collective, pot luck Thanksgiving at Pingaling’s house. I have been dreaming about what I am going to make for this celebration. I know we arent Americans, but the idea of having a day to be thankful is so resonant and powerful… well, we just cant resist. One of the things I love about reading great recipes is that they inspire me to create unique dishes of my own. For a long time now, I have been fascinated by tart tatin, the great French creation where you pour caramel into the bottom of a cake tin, layer over caramelised apples, and then top it all off with puff pastry. The pastry bakes at the top, becoming crispy and light, and the apples caramelise even further. When the tart is done, you flip it out of the cake pan, et voila! A perfectly crisp bottom, and sensuously caramelised apple. I have always wanted to make a tart tatin that was savoury… but part of the trick is that sweet caramel sauce that you pour in first. How to make something savoury with that? 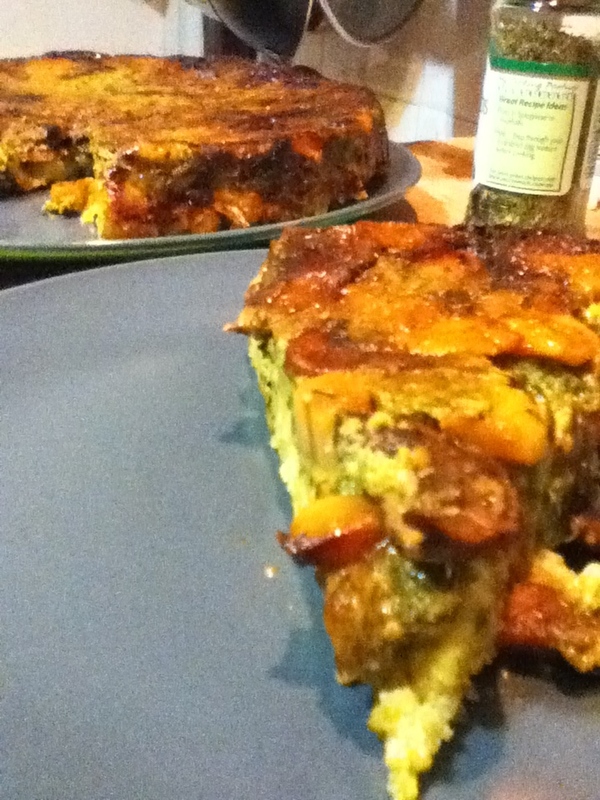 And then… I read Yotam Ottolenghi’s recipe for a caramelised garlic tart – with goats cheese and puff pastry. 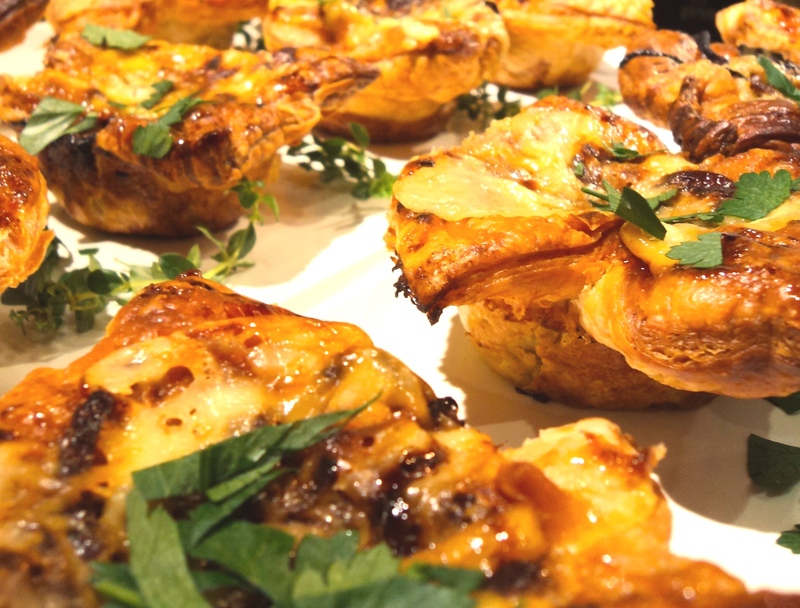 I read the actual recipe for the caramelised garlic and realised that there is a sweet savoury caramelised sauce that coats those gorgeous garlic pieces. 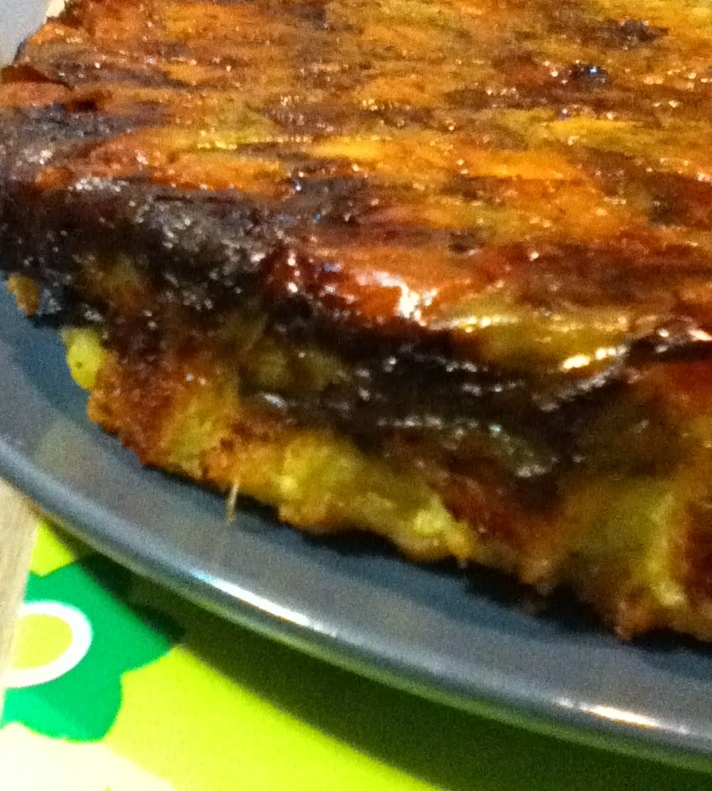 And then… I read a recipe for polenta with sauteed mushrooms. I do love mushrooms, and polenta is another obsession of mine. I fell asleep last night daydreaming of a perfect dish… and this morning, when I woke up, I knew what I needed to make a savoury polenta tart tatin. I cant tell you how happy this makes me. Its like I have figured out some remarkable puzzle. It may have been made before (after all, in cooking, relatively little is new), but I have never read a recipe like this. I loved it from the moment it popped into my head, and I was determined to make it! It took me more than 3 hours to make this today. Its a hell of a recipe, but … you could definitely do it in stages. Almost everything (even the polenta) can be made in advance and refrigerated until needed (though I would make the spinach mixture on the day). If you spend a day or two caramelising garlic, sauteeing some mushrooms and burnishing them with old thick balsamic, preparing some polenta, thickened with parmesan and butter … well, then this recipe would probably take you about 40 minutes from assembly to final stages of cooking. And I am here to tell you… Its damn worth it! It is so good. Outrageously good. Celebration, birthday, vegetarian Thanksgiving, dinner party good. Its gorgeous and dramatic, and the layers of flavour are unbelievable. Fluffy yet creamy and cheesy polenta, with a crisp crust, is topped with creamy spinach, which in turn is topped with balsamic mushrooms and caramelised garlic. Its a beautiful tart, and very dramatic. If you want to add a bit of flair, you could probably decorate it with a few sliced cherry tomatoes stuffed strategically into place, but it really does not need it. This tart is a tour de force of flavours and textures … It is sublime, if I say so myself. Break the heads of garlic up, and peel the cloves. I realised I had many different sizes of garlic cloves, so I chopped the larger pieces in half to make them all approximately the same size. Place the garlic cloves in a small saucepan and cover with water. Place over medium-high heat and bring to the boil. Lower heat so the water is simmering, and blanch the garlic for 3 minutes. Drain well. Wipe out the saucepan (make sure you do this well – oil and water sputter badly), and place the olive oil in the saucepan. Over high heat, saute the garlic for 2 – 3 minutes. You want the garlic just to begin to brown around the edges. Add the balsamic and the water (be careful, it will spit and spew at you as the water hits the hot oil), and bring to the boil. Simmer, stirring occasionally, for 10 minutes. Then add the sugar, rosemary, thyme and salt, and mix well. Simmer on medium heat for a further 10 – 20 minutes, or until most of the liquid has evaporated, and you have a thick dark caramel sauce and deep dark soft garlic. Take off heat and set aside. If you are only cooking the tart in the next day or so, transfer to a bowl or container, cover and refrigerate. Bring to room temperature before assembly. In a large non stick frying pan, heat the olive oil and truffle oil over medium high heat. Add all the portobello mushrooms, and stir well to combine, and to ensure that most of the mushrooms have been slicked with a little oil. Leave the mushrooms in the pan, not stirring, and allow them to brown and caramelise on their own. The heat and the olive oil will do the trick – you just have to NOT stir! Once you start smelling a wonderful mushroomy smell (about 3 – 5 minutes – possibly longer if your heat isnt that high), flip the mushrooms over. You should see that the bottom side is well browned. Add the Swiss browns, mix again, and allow to saute, undisturbed for another few minutes. Salt and pepper well, stir, and then add the balsamic all at once. It will immediately begin to bubble and coat the mushrooms completely. Slice the butter directly over the mushrooms, and allow it to melt into the mixture. The butter will flavour the mushrooms as well as adding a bit of needed oil to the balsamic coating. Taste, adjust seasonings, and once you are happy with the mushrooms (they should be slightly burnt, sticky, gooey, balsamic-y and intensely mushroom flavoured), tip out into a bowl and set aside. Transfer to a bowl or container if you are making the tart in a day or two, and refrigerate. Bring to room temperature before assembly. Wash the baby spinach very well, and then roughly chop it. Add the spinach to a large non stick pan over medium heat. You still want a bit of the water to be clinging to the leaves – this will help it cook. Saute the spinach briefly – a minute or two will do it – until it turns dark green. Remove the spinach from the heat, and place it in a sieve to drain the liquid from it. Allow to cool a little. In a small bowl, combine the cream cheese, cream and egg. Add the spinach (squeeze it with your hands before adding to the mix to make sure youve gotten rid of as much moisture as possible). Using an immersion blender (or you could transfer the lot to a blender or food processor), cream the spinach until it has completely integrated into the cream cheese mixture. Add salt and pepper, and mix well. Add the grated cheddar, and mix well. Taste and adjust for seasoning. Set aside until ready to assemble the tart. Polenta is usually made in a saucepan, but I actually like the quickness and control I get from making it in a large, non stick, frying pan. You need a good spatula or wide flat wooden spoon. Place a large non stick frying pan over medium heat and pour in the water and milk. Bring just to the boil, and once it boils, reduce the heat to a gentle simmer. Pour in the polenta in a steady stream, mixing constantly as you do so. This will ensure that the polenta is smooth and creamy and without lumps. Keep stirring, the polenta should begin to thicken almost immediately. I usually use an almost scooping motion – circular, and right at the end, I scoop some polenta, and flip it over itself. Almost like folding egg whites gently into cake batter. Keep stirring and scooping for about 5 – 10 minutes. If the polenta gets too thick, add the water and milk mixture in gentle dribs and drabs. Taste the polenta – it should be uniformly creamy. Any grittiness, and you need to continue cooking. Once the polenta has reached a creamy consistency of thick oatmeal, and there is no grittiness, add the salt and tons of black pepper. Stir well and combine. Add the parmesan and butter, and combine well. Taste and adjust seasonings. Set the polenta aside (in the pan if you like) until it comes to room temperature. The polenta will firm up quite a bit but this is fine. 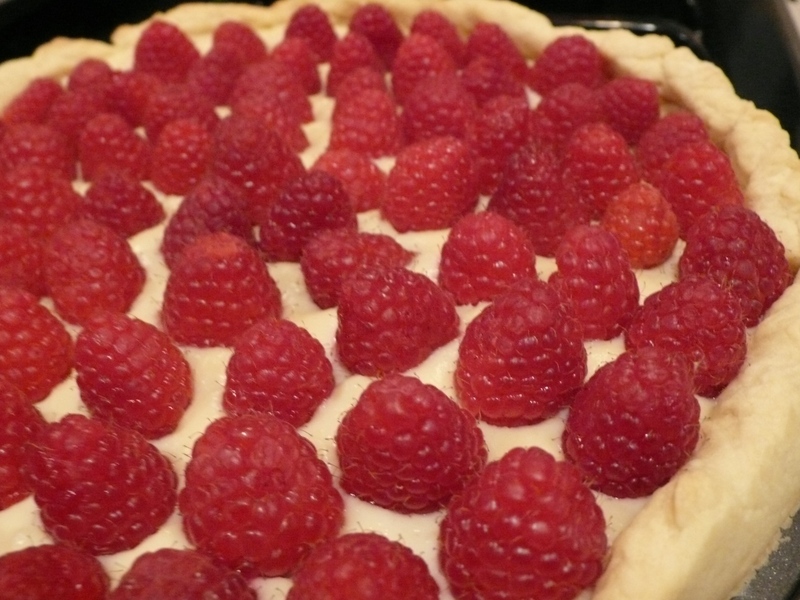 Refrigerate if you are not making the tart immediately, but bring to room temperature when you assemble. Preheat the oven to 180C (350F), and prepare a 9 – 10 inch round cake tin. Butter the cake tin, and place a circle of grease proof wax paper in the bottom. Butter this as well. Pour the syrup from the caramelised garlic, and cover the entire bottom of the cake tin with the sauce. Tilt to make sure you coat the wax paper completely. Arrange about half (or all if youre greedy – I like to keep some back for other uses!) of the garlic on the syrup, and arrange the balsamic mushrooms over the garlic. With the garlic and mushrooms, you will cover the entire bottom of the pan. Dont mix them up though, they should remain quite insular. Pour over the creamed spinach, and use a spatula or knife to ensure that the spinach completely covers the garlic and mushrooms. Bake the tart in the oven for about ten minutes, or until the spinach has firmed up and puffed a little – it will bronze a bit. Take out of the oven and allow to cool for about ten minutes or so. Prepare the polenta. Sccop up a handful of polenta, and flatten it between your hands. It should be less than 1/2 inch thick. You will have a polenta patty – place this gently onto the baked spinach in the tin. Keep doing this until the spinach is completely covered. You can patch up the polenta if there are small holes or bits youve missed. Grate the parmesan over the polenta, and bake again in the oven for about 20 minutes, or until the parmesan has burnished and become a gorgeous burnt mass on top of the polenta. Remove from oven and allow to cool for about 5 to 10 minutes, in the pan, on a cake rack. Run a sharp knife around the edges of the pan to make sure that nothing is sticking to the sides. Place a serving plate over the cake pan, and using oven gloves (as the pan may still be hot), flip the tart over in one smooth move. Remove the cake pan, and the wax paper, and adjust any bits of garlic or mushroom that may have fallen off. Serve warm, at room temperature, or even cold the next day. Any which way, its mind-blowing-ly deeeeeee-licious! 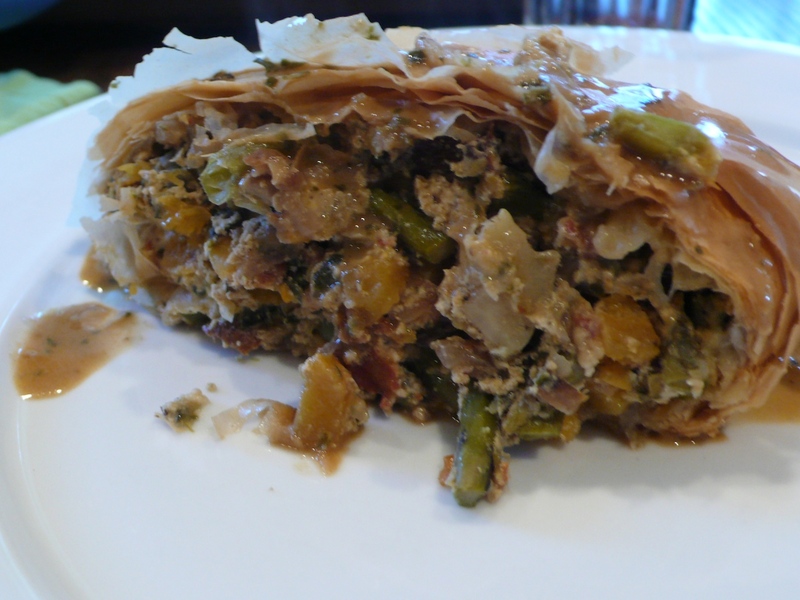 I made a spinach pie for Essia when she left us to go to Germany, and have been mulling over the workings of that pie since then. I thought may be it could have been done purely spinach (the one I did had caramelised onions on the bottom for pleasure), but I wanted it to be substantial and warming. 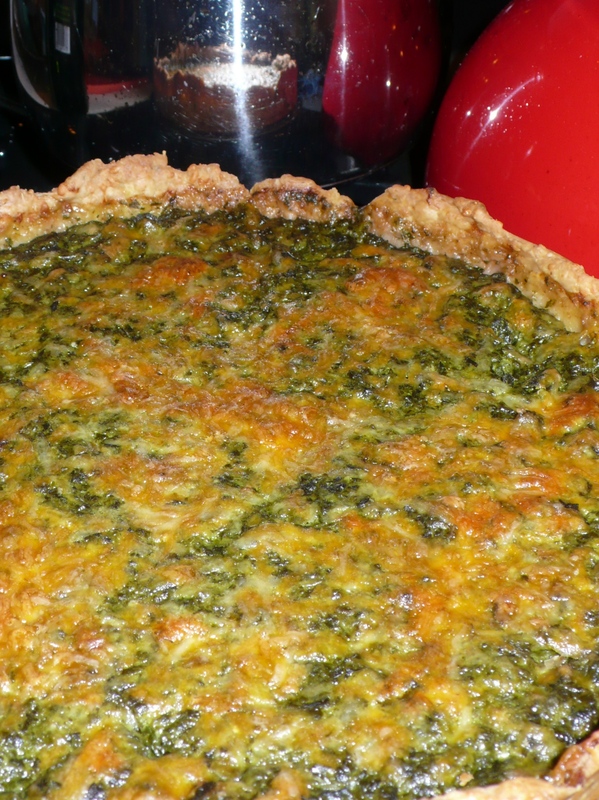 Spinach and cheddar cheese go extremely well together, and so when it came to dinner, I decided to make a spinach cheese pie – with the cheese everywhere I could get it! 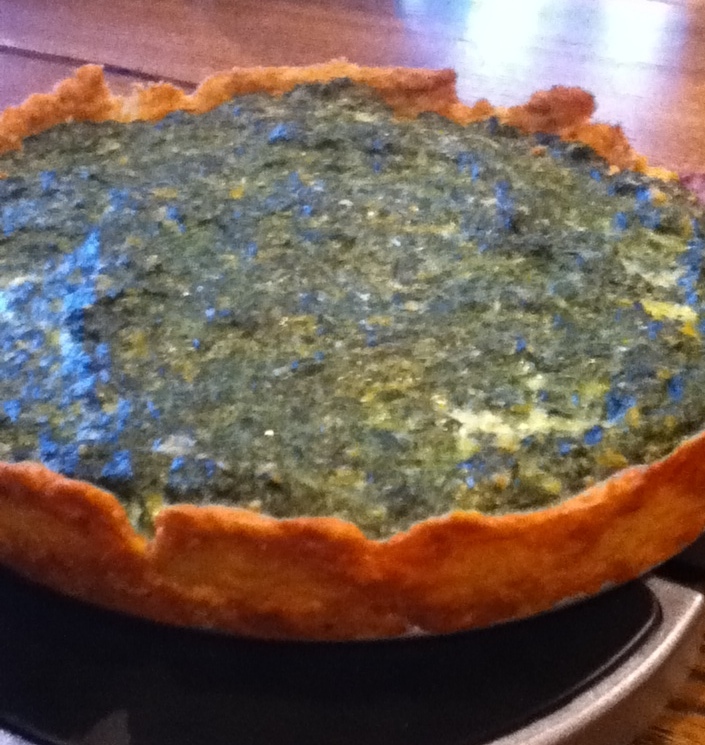 Cheese in the crust, cheese mixed with the spinach… totally delectable. This pie/tart is best made in a small spring form tart pan – I used an 8 inch pan, and it was perfect and served 4 quite well. The tart is quite rich. 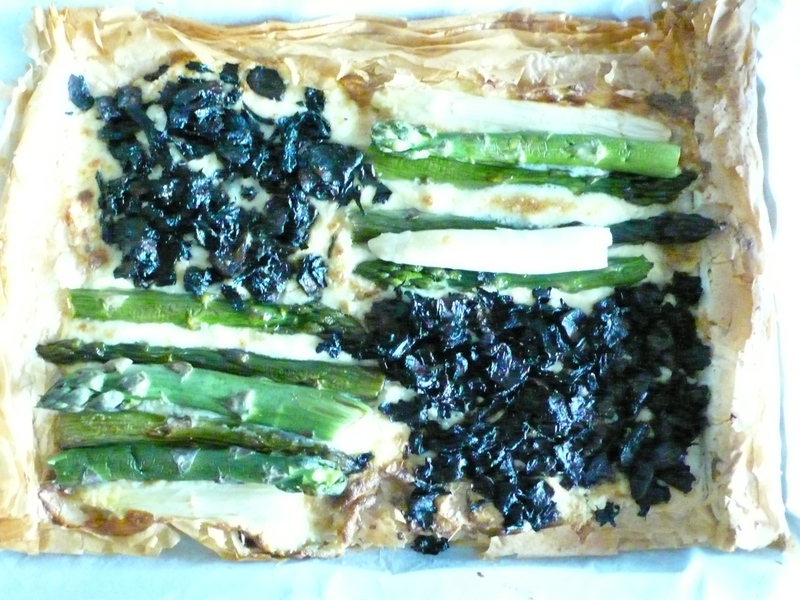 Its lovely served with a chopped tomato and onion salad just for the juxtaposition. Its also really really good the next day, cold, for breakfast! The crust was soooo good. I think its because I became shameless, and decided to make it with more cheese than flour. Flour only acts as a delicate connective marker to the crispy burnt cheese in this crust. I cant tell you how much I love burnt cheese, but this crust came close to nirvana for me. Enjoy a thin slice of this tart, and immerse yourself in the happiness of pure spinach joy. In a small bowl, mix together 1 cup of grated cheese with 1/2 cup flour. You may need more cheese or more flour as you knead the dough, so have some standing by. Sprinkle over paprika and salt, and grate in the cold butter. Using your hands – just the tips of your fingers – mix in the butter with the flour cheese mixture. You should have an oatmealy mixture. Sprinkle over 1 tbsp milk, and combine until the dough comes together. Now its up to you – sometimes I add more cheese, sometimes I add more flour – sometimes I add a bit more of both. You want a supple dough that tastes extremely cheesy, and yet has enough strength to be rolled and pressed and kneaded. Once you are happy with your dough, roll it into a circle, and flatten with the palm of your hand. Centre in an 8-inch spring form tart pan, and using your fingers, press the dough out into the pan. You should have more than enough to cover the bottom and sides of the tart pan. Refrigerate for 10 – 15 minutes, and then using the tines of a fork, poke multiple holes in the crust before baking for 15 minutes. You want the taste of spinach to come out loud and clear here, so there is no distraction – no garlic, no herbs, nothing but a touch of dusky paprika to bring out the green of the spinach. In a medium non stick frying pan, lightly saute the spinach in the olive oil until it is bright green, and has released most of its liquid. Tip the spinach into a sieve, set over a bowl, and drain, pressing down, for at least 3 – 5 minutes. You want the spinach to be quite dry. Put the dried spinach into a bowl with the paprika, salt and pepper generously, the sour cream, and eggs. Using an immersion blender, puree the spinach well. Once the spinach is a glowing smooth green mass, fold in the cheddar cheese. Taste and adjust seasonings, and add more cheese if you want (though it shouldnt overwhelm the spinach). Pour the spinach mixture into the prebaked cheddar crust, and bake in the oven for 20 – 25 minutes, or until the filling is firm. Today is a day of celebration – it is the end of the Ramadan and the Rosh Hashanah. Two very intertwined religions, and their holidays. Well, on a day like today, you just have to celebrate. 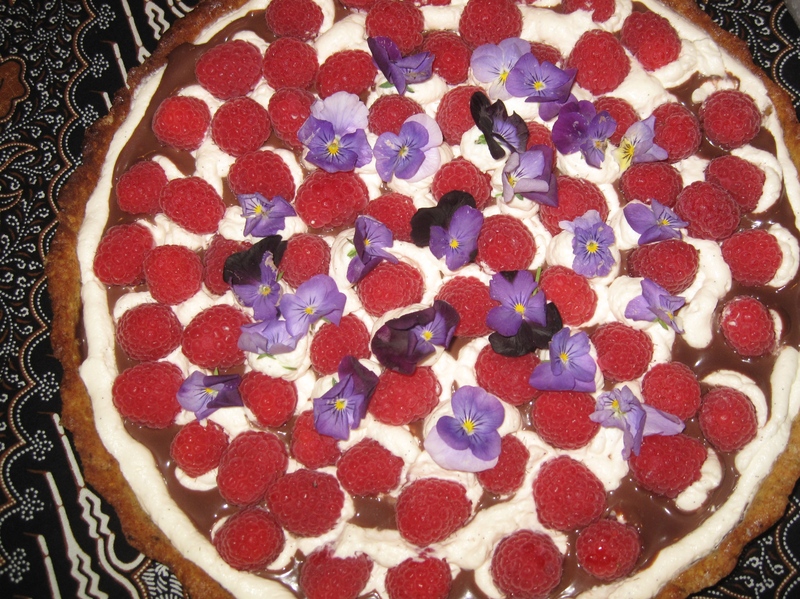 So I came up with this vegetarian (but unfortunately not vegan) white chocolate raspberry tart. 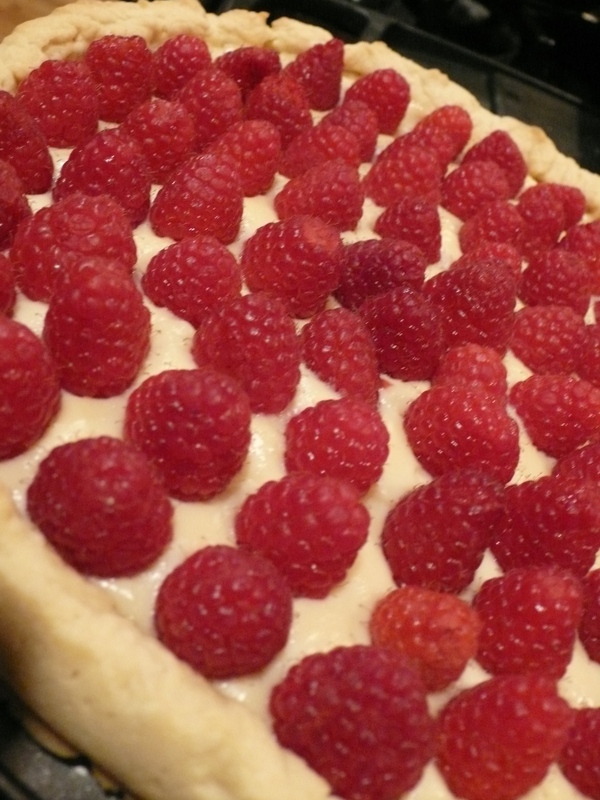 The pastry cream was imbued with the rich lusciousness of white chocolate, such a perfect match for tart sweet bright raspberries. I dont usually do fruit with chocolate, but this is the exception that proves the rule. This is a phenomenal tart. 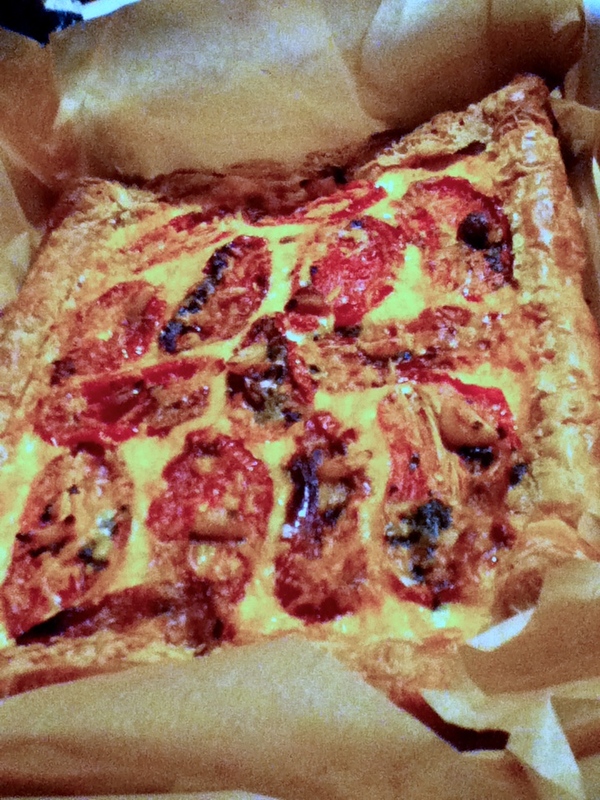 And I can say that because I have made some pretty damn brilliant tarts in my day…. but this one. It was so very good. 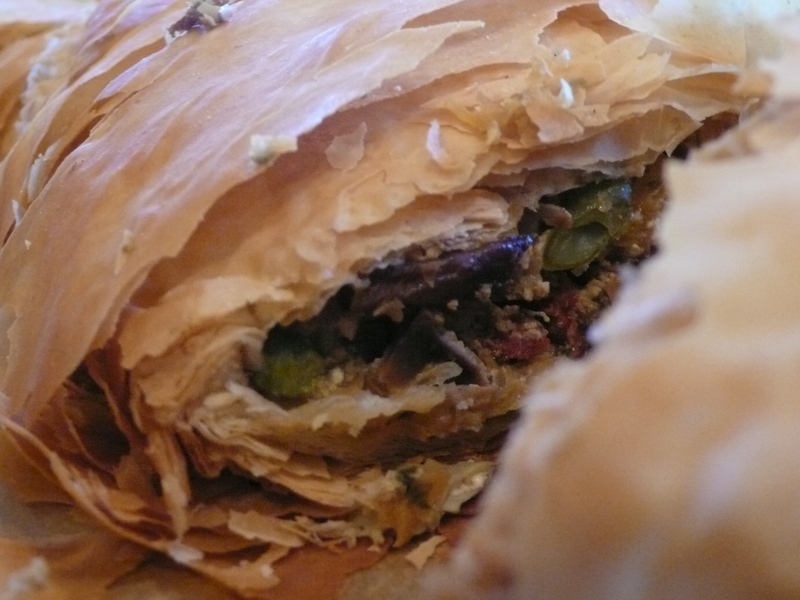 The pastry crust was like a sugar cookie – dense, buttery, flaky and scented with vanilla. The pastry cream was literally stuffed full of Callebaut white chocolate. It was so creamy, it was sinful … but the great thing about it for me was that it looked like any garden variety vanilla pastry cream. It was only upon tasting that the ambrosial flavour of white chocolate made itself known. I adore good surprises like that! 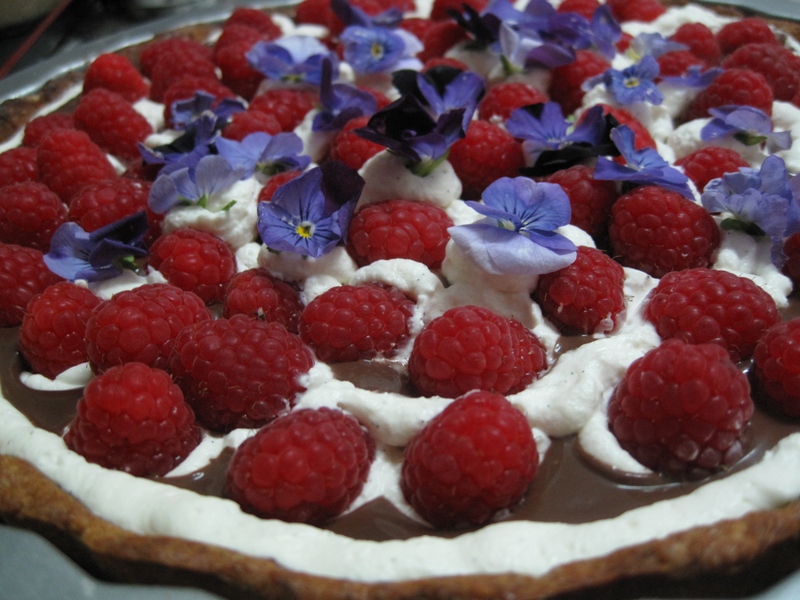 And the organic raspberries were the perfect counterpoint – tart and bursting with last of the summer sunshine, they made the white chocolate cream even more chocolate-y. This was one of my best tarts by far. And the best part was seeing family eat it so happily on this most family of celebration nights… BSA’s son was surprised I made it from scratch 😉 It takes quite something to impress a 13 year old, so I was happy. Heh. I put this tart together in literally half an hour (not including the wait times for baking and cooling off). Baking the pastry took very little time – but you need to make sure its baked through, because once it comes out of the oven, there is no more baking to do. I didnt bake it blind – I just made sure I poked tons of holes in it with my fork. It shrunk a bit, but I baked it in a 9 3/4″ spring form pan, so a little shrinkage was okay. The pastry cream took minutes to make, and about 20 minutes to cool in the fridge. Putting raspberries on top wasnt really work … but it was fun! I was actually a little shocked at how easy it was to make this tart – the return was so big, that I should have slaved for hours on it. It was a joy to present something so decadent and yet so easy to make. Start at least 2 – 3 hours before you plan to serve this tart (or the day before) as you do want it to set up in the fridge. In a small bowl, mix together the flour, sugar and salt. Use a fork and make sure it is all combined. Grate the butter over the flour mixture, and using your fingers, toss to combine well. You should have oatmeal flakes of butter within the flour mixture. In another small bowl, or cup, beat together the egg and the vanilla essence. Use more vanilla essence if you think your essence isnt very strong or flavourful. Pour the egg mixture over the flour mixture, and using your hands, knead to combine. You should have quite a soft dough. Tip the dough out onto a clean surface, and knead two or three times to get it soft and pliable. Using the heel of your palm, smear the dough away from you. This will spread the frozen butter in thin layers throughout the dough. Do this two or three times. Roll the dough into a ball, put it back in the bowl, and refrigerate for ten minutes or so to let it all just come together. Preheat the oven to 175C (350F). Have a pie tin, or a spring form cake pan (I used a 9 3/4″ pan) ready. Take the dough out of the refrigerator, and tip it out onto a clean surface. Using a rolling pin, roll out the dough to about 1/8″ thick, or to fit your pan. The dough should be malleable enough, and yet cold enough, so it wont stick to the surface, or to your rolling pin. If it sticks, it has not sat in the fridge long enough, so put it back for a few minutes. Once you have rolled out the dough to your liking, roll it onto your rolling pin, and centre it over your pan. Place it gently in the pan, and using your fingers, make sure all the edges are even. My spring form pan had very high edges, so I just folded the dough over and crimped it to come up about half way up the pan. It worked out fine! Put the dough back into the fridge for five minutes or so to get over being rolled and prodded! This is an important step so dont forget it! Once you take the unbaked crust out of the fridge, poke multiple holes in it with the tines of a fork. Dont forget to go up the sides! Bake in the oven for 25 minutes or so, or until completely baked through and very lightly tan in the centre. You will know if its baked fully or not by the texture of the crust. If its soft, malleable, it has not baked long enough. If its firm, and solid feeling, its fully cooked. Decide on how brown you want it – for this delicate tart, I decided to let it barely get a blush of bronze. In a small saucepan, heat the milk, 1 tbsp vanilla and white chocolate over medium low heat, stirring occasionally, until the white chocolate melts. Meanwhile, mix the sugar, flour and cornflour together very well with a whisk. Add the further 1 tbsp vanilla and the egg yolks, and whisk extremely well until everything is thoroughly combined. When the milk is quite hot, take about 1/4 cup of milk, and add it to the egg mixture. Whisk very well. Turn the heat up on the milk mixture, and allow to just come to the boil. Add all the egg mixture at once, and turn the heat down. Stir until very thick. If you are worried that the pastry cream is lumpy, you can sieve it, but its usually unnecessary as long as you have whisked the ingredients together very well at each stage. Put aside to cool, about 10 – 15 minutes. Pour the pastry cream into the crust. Arrange the raspberries on top in a pretty pattern (I usually just make rings but do as your heart desires). Refrigerate for at least 1 – 2 hours. If you are making this tart the night before, prepare all the elements separately, and assemble them together a few hours before serving.